Police Commissioner William Bratton was correct when he said last week that Mayor Bill de Blasio was slow in recognizing an obvious increase in homelessness, the mayor acknowledged Monday. EAST HARLEM — Police Commissioner Bill Bratton was correct when he said last week that Mayor Bill de Blasio was slow to recognize an obvious increase in homelessness, the mayor said Monday. “I think a mistake that the administration made early on was not validating what we all were seeing," Bratton said during a panel discussion at the Manhattan Institute. De Blasio, speaking at Hunter School of Social Work in East Harlem, said he was "comfortable" with the assessment of his police commissioner. "We needed to better explain the situation to the people because it was changing rapidly," said de Blasio, who said he had yet to speak with Bratton about his homelessness remarks. Early in the summer, de Blasio denied there was an increase in homelessness even as DNAinfo New York reported that 311 homeless complaint had jumped 60 percent since de Blasio took office. In December, there were a record high 59,000 people in the city's shelters. That figure stood at 58,000 as of Friday, according to the Department of Homeless Services daily census. There were approximately 51,000 people in shelter when de Blasio took office on Jan. 1, 2014. De Blasio blamed the problem on former Mayor Michael Bloomberg for cutting a rental subsidy program that kept people in their homes, as well as media coverage and public perception. The mayor also held a weekly emergency meeting on the issue with his top administrators even as he was publicly denying a problem, as DNAinfo New York first reported. And then de Blasio's well-regarded deputy mayor overseeing homelessness resigned her position. De Blasio finally admitted on WNYC that there was an issue. "There is both a perception and a reality problem," de Blasio told Brian Lehrer. On Monday, de Blasio said that he failed to explain to the public that there had been a shift in the nature of homelessness where the constant number of people needing shelter did not change. The mayor has blamed this shift on the effects of the economic crisis combined with skyrocketing rents. "We were putting more and more energy and more and more resources in getting people out of shelter into housing just to have them replaced ever more quickly by new people who needed shelter," said the mayor. The city says that more than 50,000 people have exited shelters since de Blasio took office, with close to 19,300 of them finding permanent housing through various city programs. "I think I should have done a better job of explaining that to people six months or more ago and also showing them all the effort that was being expended to address the problem. That's certainly a mistake I won't make again," he added. 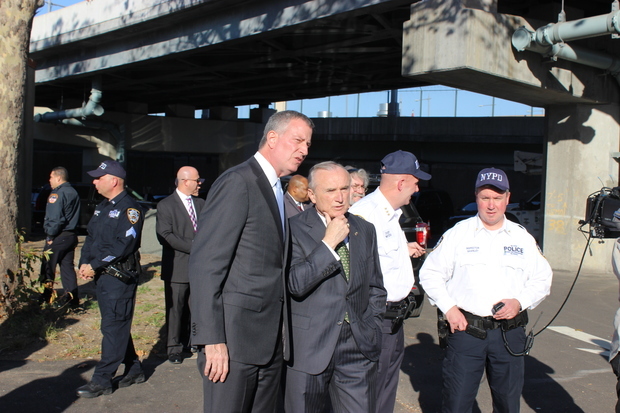 Overall, said de Blasio, he and Bratton "agree overwhelmingly," but not always. "He certainly does word some things differently than I would," said de Blasio. "But I don't think that's a problem, he's speaking from the heart."